C.B.I. has added the Ultimate SP-64 64-channel snake system to its existing line of pro grade Star Performer audio snakes. The new system compliments CBI's existing StarPerformer series that features 40-56 channel audio snakes. 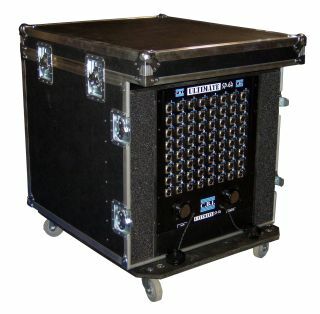 Available in rack mount or stage boxes, these pro units include a 14 ga. rolled steel box with "hammer-tone" black baked enamel finish inside & out. The Ultimate SP-64 utilizes CBI 66 pair cable; Neutrik locking XLR's, isolation transformers and ground lift switches. All new M201 Tourline circular disconnects are engineered to withstand a heavy work load, dropped from heights, driven over by vehicles, subjected to rough handling on a regular basis, these connectors are expected to provide continuous reliable performance. The M201 connector is the “definitive” solution for touring (PA) or outdoors broadcast (OB) environments. Thicker wall section coupling nuts and shells, give increased impact resistance. Rolling pins in the coupling nut allow for easier mating and increased mating cycles. M201’s are configured in the same 201 contact positions as many 200/201 systems in use today. In addition to standard system configurations, the Ultimate SP-64 is also available with protective Rock Series nylon mesh over braid on fan-outs and in custom built CBI road case for added protection. CBI's StarPerformer Series, as well as other CBI products, will be on display at the InfoComm Show (Booth 6668), June 17-19, located in Hall A at the Orange County Convention Center.